[144 Pages Report] The Artificial Intelligence (AI) platform market is said to have a potential scope for growth in the years to come, due to the generation of large amount of data that requires analysis to improve decision-making process of service providers. The growing demand for AI-based solutions and proliferation in data generation are some of the major driving factors for the market. 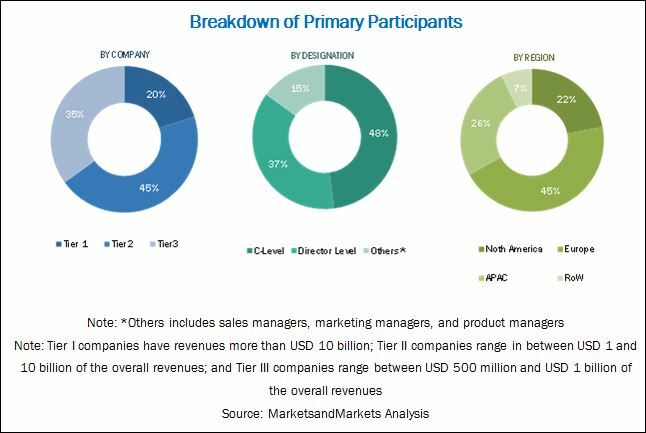 The AI platform market size is expected to grow from USD 2.12 Billion in 2016 to USD 9.88 Billion by 2022, at a Compound Annual Growth Rate (CAGR) of 30.5%. The base year considered for this study is 2016, and the forecast period considered is between 2017 and 2022. The objective of the study is to define, describe, and forecast the global AI platform market on the basis of tools (Natural Language Processing (NLP) and Machine Learning (ML)), services (managed and professional), deployment modes (cloud and on-premises), applications (forecasts and prescriptive models, chatbots, speech recognition, text recognition, and others (includes face detection, sentiment analysis)), and regions. The report also aims at providing detailed information about the major factors influencing the growth of the AI platform market (drivers, restraints, opportunities, and challenges). The major AI Platform vendors are Microsoft (US), Google (US), Salesforce (US), IBM (US), Intel (US), Amazon Web Services (US), HPE (US), Ayasdi (US), Qualcomm Technologies (US), and Absolutdata (US). These Artificial Intelligence Platform Vendors are rated and listed by us on the basis of product quality, reliability, and their business strategy. Please visit 360Quadrants to see the vendor listing of Artificial Intelligence Platform. The global AI platform market is expected to grow from USD 2.61 Billion in 2017 to USD 9.88 Billion by 2022, at a Compound Annual Growth Rate (CAGR) of 30.5%. The major driving factors for the market are a proliferation in data generation, increasing demand for AI-based solutions, increasing operational efficiency and reduced cost, and growing need to enhance customer experience. In the tools segment, Machine Learning (ML) tool is expected to have a larger market share and is expected to grow at a higher CAGR during the forecast period. AI platform tools help in deploying AI enabled algorithms or API’s. Various industry sectors such as Banking, Financial Services, and Insurance (BFSI), healthcare, and retail and eCommerce are deploying AI platform applications to analyze large amount of data, required for making a better decision. In the services segment, the managed service is expected to grow at a higher CAGR, and is expected to be a larger contributor among all the services. The managed service is said to be growing faster, as there are 2 modes for deploying AI platform: cloud and on-premises. The complexity involved in maintenance and support of infrastructure management is sorted by managed service providers, who enable organizations to use AI platform enabled solutions at its full potential. In the deployment mode segment, the cloud deployment mode is expected to have the largest market share, also it is expected to grow at the highest CAGR during the forecast period. Cloud-based solutions offer wide and agile solutions to cater to the AI platform market. In the application segment, the forecasts and prescriptive models is the expected to have the largest market share, whereas text recognition is expected to grow at the highest CAGR during the forecast period. The forecasts and prescriptive models help in the analysis of customer behavior as well as to recognize specific patterns in the data. In the end-user segment, the BFSI sector is expected to be the highest contributor, whereas the healthcare sector is projected to grow at the highest CAGR during the forecast period. Both sectors are deploying AI platforms to get insights from a large amount of data, enhance customer experience, analyze trends from the data, and enhance decision-making process. The other end-users, such as manufacturing, retail and eCommerce, transportation, and research and academia are contributing significantly to the AI platform market due to the concerns such as increased need for real-time data, reduced time to response to customer queries, and improved business process time. These verticals are also expected to witness significant growth rates during the forecast period. 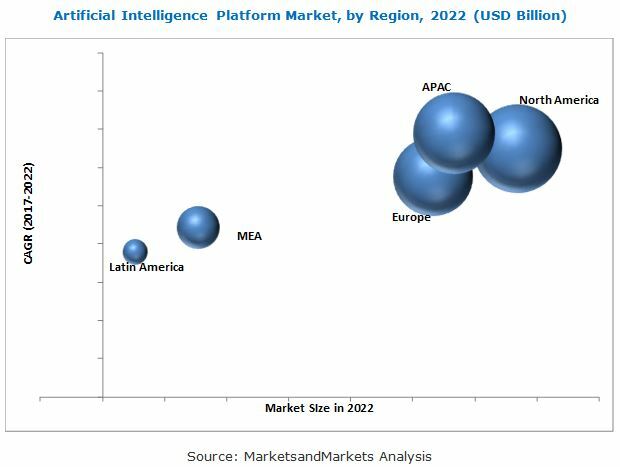 The global AI platform market has been segmented on the basis of regions into North America, Europe, Asia Pacific (APAC), Middle East and Africa (MEA), and Latin America. North America is estimated to be the largest revenue-generating region. This is mainly because, in the developed economies of the US and Canada, there is a high focus on innovations obtained from R&D. These regions have the most competitive and rapidly changing AI platform market in the world. The APAC region is expected to be the fastest-growing region in the AI platform market. The higher technological advancement and rapid expansion of domestic enterprises in the APAC region, has led APAC to become a highly potential market. Lack of skilled employees and data privacy issues across emerging economies are some of the obstacles in the growth of the AI platform market. These factors account for the risk of failure to perform in the competitive business world, which necessitates the need for AI platform solutions. The major vendors that offer AI platform solutions across the globe are Microsoft (US), Google (US), Salesforce (US), IBM (US), Intel (US), Amazon Web Services (US), HPE (US), Ayasdi (US), Qualcomm Technologies (US), and Absolutdata (US).